Summary: Kids love to put stickers on their helmets. They may increase acceptance of the product. But bicycle helmet stickers are not a simple question because adhesives on some could damage your helmet. Overall, the risk is probably not great. Every sticker must have adhesive of some type to hold it on, and adhesives have solvents in them that aid the sticking process. If the solvents are incompatible with the helmet shell they can possibly attack the plastic, weakening it. The plastic could "craze" ujnder the sticker with jillions of tiny cracks running in all directions. The damage may not be visible since it is covered by the sticker. And the weaker plastic may or may not ever make a difference in a crash, depending on where you hit. Crazing is most likely with liquid solvents, as opposed to the small amounts in stickers, but a sticker could possibly do it over time. To make sure there is no problem, you need stickers with adhesives compatible with the shell of your helmet, or if you are running a helmet promotion campaign some stickers that fit with the various shell materials out there: PET, Lexan, other Polycarbonates, ABS, polyurethane, EPU, and possibly others. "...many adhesives are available throughout the industry and it would be impossible to tell what the effect would be without testing the tape or sticker product on the respective helmet materials.... although we believe the 3M PSA retro reflective tape adhesives would not affect the helmet shells, because of the small amount of residual monomers in the adhesive, the use of all tapes/stickers should be tested to insure compatibility with helmet shells." So if you are dealing with a single brand and model of helmet the manufacturer should be able to tell you what stickers are compatible with their shell. Since shells on cheap helmets are all taped or glued on, and the tape relies on adhesive, there are clearly at least some adhesives that are not a problem. But to be entirely safe, you should ask the sticker manufacturer about adhesive compatibilities before using the sticker on a helmet. As a practical indication of what might be happening in the field, the Snell Memorial Foundation has informed us that the hundreds of crashed helmets they examined in a study done in the mid-1990's with Harborview Injury Prevention Center showed no ill effects from any of the stickers that had been applied. In 2001 stickers certified for compatibility became available from K-OS Designs. According to K-OS, their stickers are compatible with all certified helmets. And the Snell Memorial Foundation supports that statement for any Snell-certified helmet. Until some time in early 2005 you could check out their sticker kits on the K-OS Designs Web site, but it seems to have disappeared. Unfortunately, there are not many Snell-certified bicycle helmets around at present. Applied Graphics sent us some samples of their product that had been applied to an inexpensive helmet with a PET shell over a year earlier. We could not find any evidence of either crazing or weakening of the shell material when we disassembled the helmet. Their reflective or florescent materials can be found on their Web site. We found the reflectivity of their reflective samples decent. The florescent materials are not intended to be reflective. We were concerned that we may be making too much of the sticker question, and that any damage to helmet shells might not have a significant effect on impact performance. 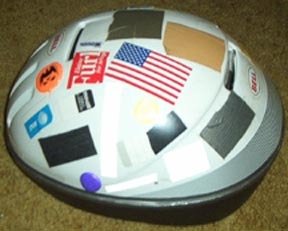 In March of 2002 we plastered a Bell Ovation helmet with every type of sticker and tape we could think of and put it in a sunny window, then in a hot-and-cold attic to age. The tapes included regular Scotch brand Magic Tape, electrical tape, packing tape and even duct tape with very aggressive adhesive. The stickers included return address stickers, stick-on Velcro, decals and kids-style stickers of all types. In December of 2003, 18 months and two hot summers later, we took the shell off the helmet and removed all the tape and stickers. We examined the shell with a magnifying glass and found no indication of damage anywhere, inside or out. Then we put the shell back on the helmet and "tested" it for brittleness with hammer blows all over the surface. It was a crude test, but interestingly enough the only spot that was brittle enough for the hammer to take a chunk out of the shell was the one that had been covered by duct tape, with its particularly strong adhesive. Bear in mind that this was a single helmet sample, with a single shell material, and does not cover the whole range of materials out there. But from this experiment we concluded that the Snell statement above is probably correct, and stickers are not really a practical problem even though in theory they could be. We do certainly recommend that you not put anything with an adhesive as aggressive as duct tape on the outside of your helmet! For other types of stickers we are still more comfortable recommending that you check with the manufacturer than just issuing a blanket statement that stickers are not a problem. We have a page up on the results of our study of solvents and hair care products applied to helmets. We really had to try hard to damage a helmet enough to reduce impact performance. It is possible that a sticker on the outside of a helmet can add sliding resistance to a helmet. You want your helmet to slide easily when you hit the pavement, since the alternative, catching and jerking your neck, can increase your injuries. Slick plastic slides well. Plastic with a rougher sticker on it probably slides less well. But we don't believe anybody has ever tested that in a lab. There are significant differences between slick plastic and bare styrofoam--that much has been tested and quantified in lab studies--but we just don't know about stickers. Until we know more, you are taking some but not much risk with a sticker unless it is known for sure to be compatible with the helmet shell. It may well accomplish something that is worth the tradeoff for that small risk. Sticking on a mirror mount seems justified by the safety enhancement of the mirror. We also recommend adding reflective tape to helmets, which has the same effect on sliding resistance as a sticker, but also has a tradeoff as a small improvement in nighttime safety. And inside the helmet an identification sticker can be useful (see below). That leaves the child helmet question. You might well put a sticker on a child's helmet if that made them agree to wear it, on the theory that a helmet on the head, stickered or no, is so much better than no helmet at all. In addition, a child is probably less likely than an adult to crash at very high speeds where small differences in sliding resistance could be really important. The balance hangs on the question of whether or not stickers really contribute to persuading a kid to buy in to the helmet idea. We still recommend checking if possible to make sure the sticker and shell material are compatible. Some manufacturers provide an identity label for the inside of their helmets. There are several third party providers of identity labels as well. Many cyclists have no id info when they arrive at an emergency room, and some cannot be identified until an anxious family member begins calling hospitals, so the stickers make sense. The manufacturers have a lot of experience with labels, so theirs would be compatible with the helmet foam. We have been asked by a school if it's ok to write a child's name inside the helmet on the foam or to use a label inside a helmet. You could write the name on one of the stickers already in the helmet, but you might obscure the original info on the sticker. You could use a water soluble marker like the ones sold for labeling CDs and DVDs. They are designed to mark the surface of the disk but not penetrate it and ruin the writing side as solvent-based markers can do. We don't think that would compromise the foam. We would avoid the ones that are solvent-based, as the typical Sharpie brand marker is. Solvents do attack the foam. You can use a crayon. It is wax based, and would probably not hurt the foam at all. It could even be washed off if necessary. You could use colored chalk. It is less permanent than the other methods, but should not affect the foam at all. We would put the name in the top of the helmet. Studies have shown that there are very few impacts on the very top.